Tuberculosis peritonitis appearing in postpartum period is a rare entity. A case successfully managed with surgical intervention is presented here. WHO statistics, identifies tuberculosis to account for 15-34% of indirect causes of obstetric mortality and this is associated with a six-fold increase in perinatal mortality. While lymphadenitis is the most common extrapulmonary site of tuberculosis, tuberculous peritonitis is a rare entity. A multiparous woman presented in postpartum day 17 with acute abdominal distension. Exploratory laparotomy showed pyoperitoneum with tubo-ovarian abscess. A 32 year old married woman para 4 living 4 presented on 17th day following normal delivery to the emergency department, with complaints of abdominal pain over the past 2 days. She had an indwelling Foley’s catheter on admission. Urosac bag had 200 ml of clear urine. This abdominal pain was generalized, and gradually increasing in severity, not responding to antispasmodic medication given by private practitioner. Patient also complained of gradually progressive breathlessness and giddiness. There were no complaints of vaginal bleeding, vomiting, constipation, urinary complaints or fever. There was no problem in breastfeeding. There was no history of any major medical or surgical illnesses or past history of Kochs’. She had delivered a male child of 2.6 kg uneventfully. She was HIV negative. On examination, patient was pale, afebrile, tachypneic with a respiratory rate of 40 cycles per minute ,tachycardia with pulse of 120 beats/ minute, low volume, and a blood pressure 90 /60 mm Hg. Heart sounds were normal and no adventitious sounds were heard on respiratory auscultation. Abdomen was distended with free fluid, there was generalized tenderness, guarding and mild rigidity. Speculum examination did not show any foul smelling discharge or lochia. Bilateral forniceal fullness was present due to free fluid, and uterine size could not be estimated. Colpopuncture was done which showed greenish, purulent, foul smelling discharge. This was sent for aerobic culture sensitivity and TB PCR. Patient was admitted and started on intravenous Piperacillin Tazobactum, Amikacin Metronidazole, crystalloids and colloids. Chest x ray was normal. Erect abdominal x-ray showed dilated bowel loops with no obstruction. Plain CT abdomen and pelvis confirmed presence of hemorrhagic ovarian cyst with feature of rupture. One unit of blood transfusion was started for hemoglobin 8.6 g/dl. Hypokalemia (serum potassium level of 2.9 mEq/lit) was corrected by parenteral infusion of 20 mEq/litre of potassium chloride. Rest of biochemical parameters were in normal range. Exploratory laparotomy was done along with the surgeon. Upon opening parietal peritoneum approximately 1.5 L of foul smelling pus was drained and sample sent for examination. Uterus was bulky and left sided tube and ovary was normal. 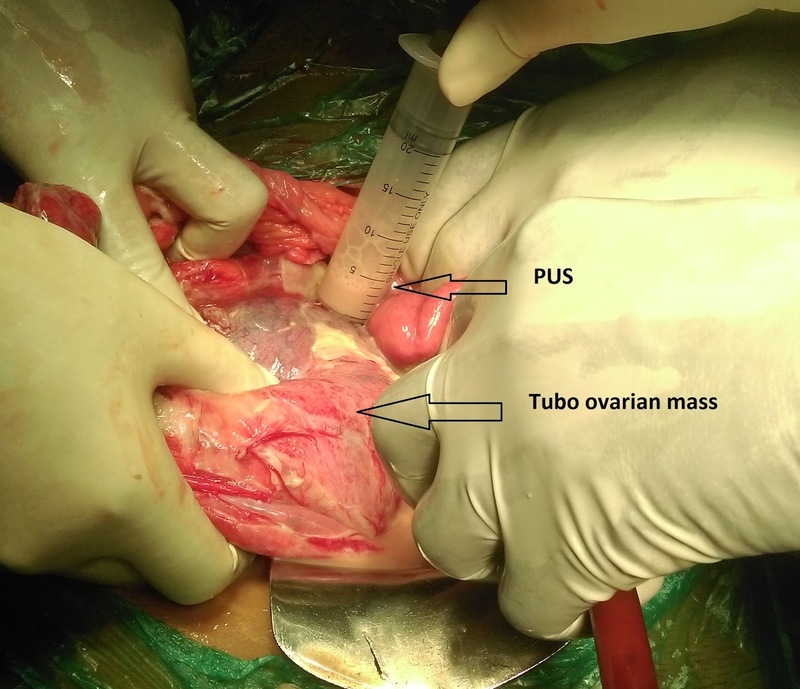 Right sided tubo-ovarian mass (T-O mass) around 10x6x5 cm was noted extending to the right pelvic wall, which was discharging pus (figure 2) Thick omental mass was stuck between tubo-ovarian mass and ascending colon. 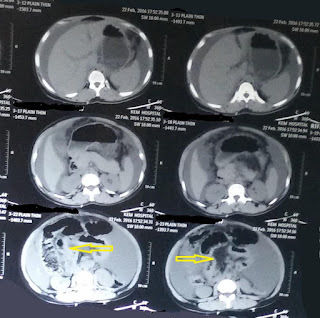 Small bowel loops were matted, (figure 3) stuck but easily separable. Entire length of bowel was traced and no sign of obstruction or injury was seen. The T-O mass was excised by applying clamp between base of the mass and right uterine cornua; base was transfixed with polydiaxanone No.1 suture. 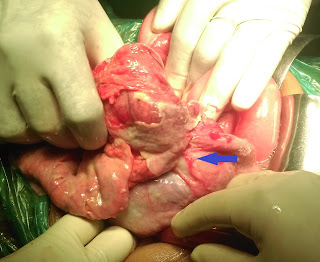 Partial omentectomy was done and by blunt and sharp dissection, the omental mass was released from the ascending colon. Specimen was sent for histopathological examination. Thorough intraperitoneal lavage was done with normal saline. Hemostasis was achieved and peritoneal drains were placed – one in Morrison’s pouch and other in pouch of Douglas. In the post operative period, intra-peritoneal drain output gradually reduced from 400 ml on day 1 to 50 ml by day 5; following which it was removed. The drainage was sero-sanguineous in nature. Serum electrolytes were monitored twice a day and hypokalemia was corrected with slow intravenous infusion of KCl (20 mEq/litre in 500 ml of DNS). Figure 3. Intraoperative image showing matted bowel (arrow). Gastrointestinal decompression was maintained by indwelling Ryle’s tube for 5 days. It initially drained 320 ml of bilious aspirate in the first postoperative day which gradually reduced to 100ml on day 5; following which it was removed. Patient recovered from paralytic ileus by day 8 and then she was started on oral liquids. Category I anti-tuberculous therapy was initiated in consultation with local RNTCP center. Upon starting oral diet, patient had 8-10 episodes of diarrhoea; all antibiotics were stopped and stool examination was done. It showed no abnormalities. Lactobacillus suspensions were given orally twice a day, and she was kept hydrated with oral rehydration solution. The patient recovered on day 13. On histopathology ovarian and fallopian tubal structures showed dense inflammatory infiltrates consisting of neutrophils, plasma cells, lymphocytes and macrophages; with caseous necrosis. Histopathology confirmed tuberculous etiology that was acute on chronic presentation. Patient was advised to continue breastfeeding. No specific anti-tubercular therapy was advised for the neonate. Patient was comfortable; hence discharged on postoperative day 15. Patient followed up on day 24, was compliant to treatment; sutures were removed and wound was healthy. As per WHO statistics, approximately 5 lakh women died from TB in 2014. TB accounts for 15-34% of indirect causes of obstetric mortality and is associated with a six-fold increase in perinatal mortality. While lymphadenitis is the most common extrapulmonary site of tuberculosis, tuberculous peritonitis is a rare entity. Our patient probably had latent tuberculosis which had an exacerbation during the postpartum period. Due to increasing levels of progesterone in pregnancy, a Th2-type immune response is favored and the Th1 helper cells are suppressed. This change is reversed in the postpartum period. It is now know that women in early postpartal period are twice at risk to develop tuberculosis than pregnant women. This is attributed to the “immune reconstitution” occurring in this period, which can result in increased susceptibility to fresh infection and reactivation of tuberculosis. [3,4,5] The common manifestation of tuberculous peritonitis are insidious fever, anorexia, abdominal pain and exudative ascites. However, in our case, the patient presented with abdominal distension and shock. Such an acute and rapid presentation of pelvic tuberculosis with shock in the puerperal period, necessitating operative intervention has been described sporadically. The peritoneal fluid analysis showed neutrophilic predominance in our patient. Though lymphocytosis is the most common picture, an initial phase of neutrophilia is described as common. Peritoneal fluid ADA levels were high in this patient (81.8u/l). Cut off value of ADA which suggests tuberculous etiology is 24 u/l. Sensitivity, positive predictive value, specificity and accuracy of ADA for diagnosis of tuberculous peritonitis were 87.5%, 95.45%, 83.33% and 86.67% respectively, as reported by Ali et al. However it has a poor negative predictive value of 62.5%. [8,9] A 3 year study was conducted on 300 patients by Rana et al to evaluate the role of various laboratory investigations in the diagnosis of abdominal tuberculosis. It was concluded that though PCR is a highly specific test, but due to high costs, it has limited value in clinical practice. In the same study, FNAC under ultrasonographic guidance resulted in 81% yield and was concluded to be a reliable and cost effective alternative. The gold standard for diagnosis of abdominal tuberculosis is a combined detection on tissue biopsy examination and identification of acid fast bacilli on staining in tissue fluids and tissue cuts. In our patient the acid fast bacilli was not detected in peritoneal fluid, or in the tubo-ovarian abscess. Though tuberculosis is recognized more commonly in the postpartum period, presentation in early pregnancy has also been described. Our patient was started on category one anti-tuberculous therapy in the immediate postoperative period, though patient was breastfeeding. Anti-tuberculous therapy appears to be safe during lactation. With the introduction of second line therapy and many newer drugs, there has been a plea for increased intake of pregnant and postpartum patients into anti-tubercular drug trials. Tuberculous peritonitis with shock in a postpartum period is a rare presentation. But high index of suspicion and prompt operative management with early initiation of antituberculous therapy can give good patient outcome. WHO: Tuberculosis in women. WHO fact sheet. November 2015. Available from: http://www.who.int/tb/publications/tb_women_factsheet_251013.pdf . O’ Brien RJ, Raviglione MC. Tuberculosis.In: Longo LD, Kasper DL, Jameson JL, Fauci AS, Hauser SL, Loscalzo J. eds. Harrison’s Principles of Internal Medicine.New York. 18th edn. McGraw Hill 2014. Pg no 1340-3. Mathad JS, Gupta A. Tuberculosis in pregnant and postpartum women: epidemiology, management, and research gaps. Clin Infect Dis. 2012 Dec; 55(11):1532–49. Zenner D, Kruijshaar ME, Andrews N, Abubakar I. Risk of tuberculosis in pregnancy: a national, primary care-based cohort and self-controlled case series study. Am J Respir Crit Care Med. 2012 April;185(7):779–84. Ormerod P. Tuberculosis in pregnancy and the puerperium. Thorax. 2001 Jun; 56(6):494–9. Dülger AC, Karadaş S, Mete R, Türkdoğan MK, Demirkıran D, Gültepe B. Analysis of cases with tuberculous peritonitis: a single-center experience. Turk J Gastroenterol. 2014 Feb; 25(1):72–8. Agarwal M, Das A, Singh AS. Pelvic tuberculosis and shock in the puerperium. South Med J. 2011 May; 104(5):358–9. Rana S, Farooqui MR, Rana S, Anees A, Ahmad Z, Jairajpuri ZS. The role of laboratory investigations in evaluating abdominal tuberculosis. J Family Community Med. Jan 2015;22(3):152–7.